Finally, my vintage bits that I collected for our old master bath have a new home! From the time we moved into our townhouse a few years ago, I’ve wanted to renovate the master bathroom. In our former home, we had built on an extension with a brand new bath and I had enjoyed decorating it to my taste. But when we moved into this house, the ensuite bath was so ‘builder’s-grade-boring’, in fact even dark and dreary, that it seemed pointless to try to style it. Sure, the layout was fine and even quite spacious. But the colors, materials and fixtures had to go. You can see what it looked like when we moved in, below. After three years of patiently waiting, I now have the elegant white bathroom I’ve been dreaming of. As with our kitchen renovation which you can see HERE, I wanted to keep costs down by changing as little as possible and yet still wind up with a complete transformation. You’ll see below exactly how we did that. 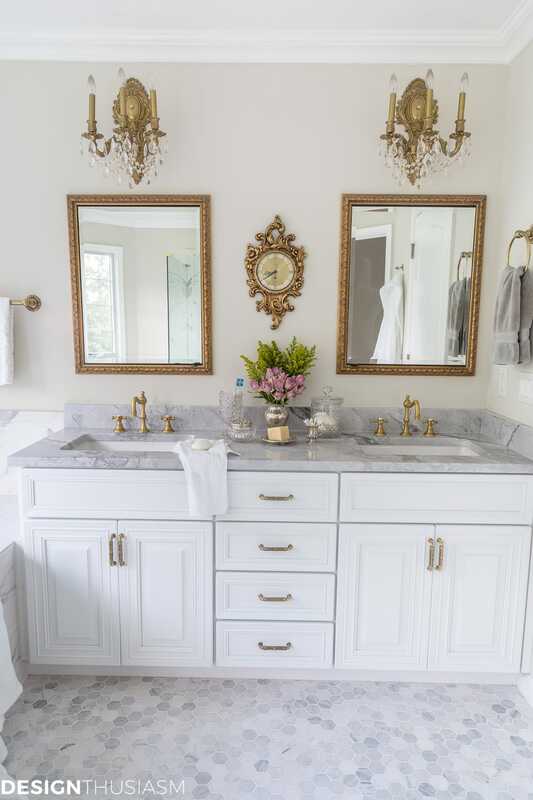 Before we even moved in, the first thing I did was remove the large unframed mirror and typical builder-grade lighting and replaced them with gilt framed medicine cabinets and crystal and brass sconces. We also painted the walls my favorite tapestry beige color, since I knew this room would eventually be white. And then it sat like that for three years! I did my best to add the pretty in, but my vintage pieces just never worked with the dark materials that dominated the space. I considered just updating the existing vanity and with paint, a new counter and pretty hardware, that could’ve worked. That’s exactly what we did in our kitchen and it’s a huge money saver. In this case, however, the reason why I chose to replace the vanity is because it was simply too tall for me. It was driving me crazy that I could barely bend over the sinks and every time I washed my face the water would splash everywhere. This was the one thing hubby disagreed with, but there are 4 other tall sinks upstairs that he can use if he doesn’t feeling like bending down, so that’s a battle I easily won. Once it was decided that we would replace the vanity, it gave me the freedom to select the door styles that I wanted and add a fourth drawer to the center section of the piece. Next up was the tub surround tile. I had decided early on that I would keep the existing tub because this was a place I could reasonably save money. While I really do love free a standing tub, it was not a must-have for me and this was a significant savings to just replace the tile. I chose marble-look porcelain tile in an oversized rectangle which contrasted nicely against the hexagon polished marble floor. You can read more about the tile in THIS POST. 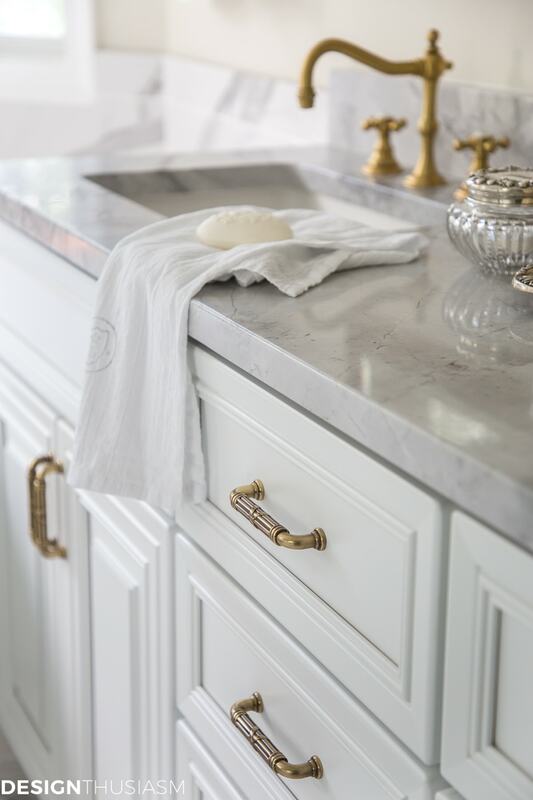 For my countertops I went with a pale grey marble and chose white rectangular sinks. 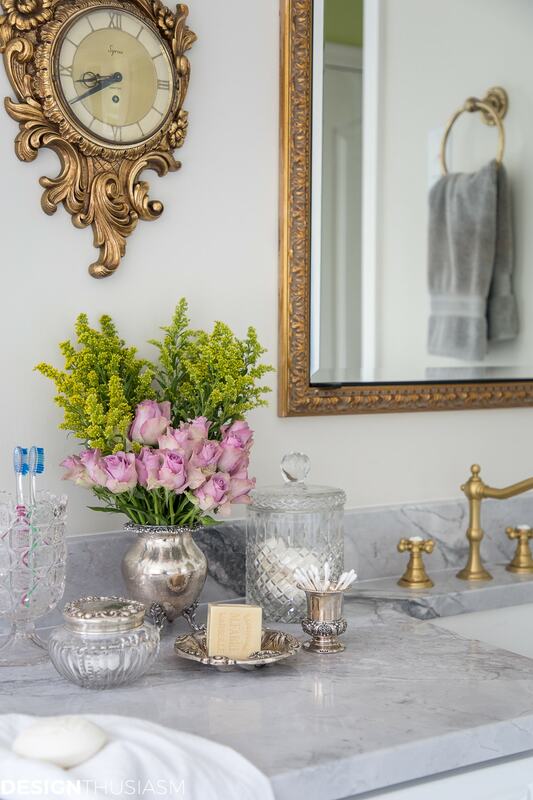 I used antique brass ribbon and reed vanity pulls and carried the same feeling into the towel bars, hooks and paper holder. Without a doubt, my favorite detail is the satin gold plumbing fixtures which I had to wait many weeks beyond the quoted date to receive. 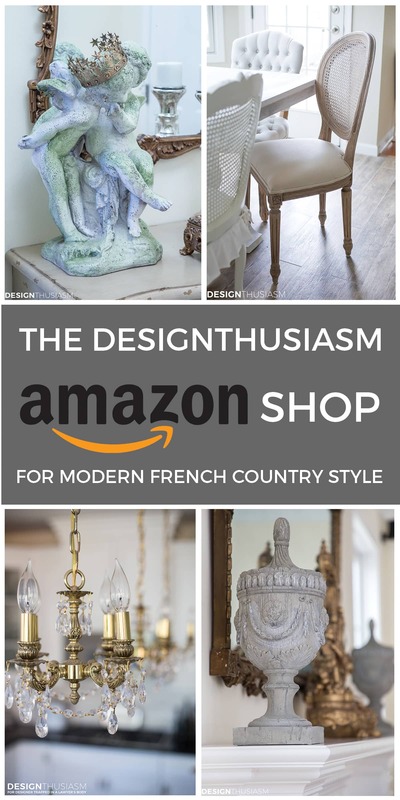 In the spirit of full disclosure, this is NOT a place where I saved money, although I linked some similar, more affordable styles in the resource section below. For me, the gold hardware playing off the white and grey marble is the quintessential design concept I was going for, so I invested a bit here. I was so excited to bring out my vintage pieces and see how perfectly they worked with the new space. 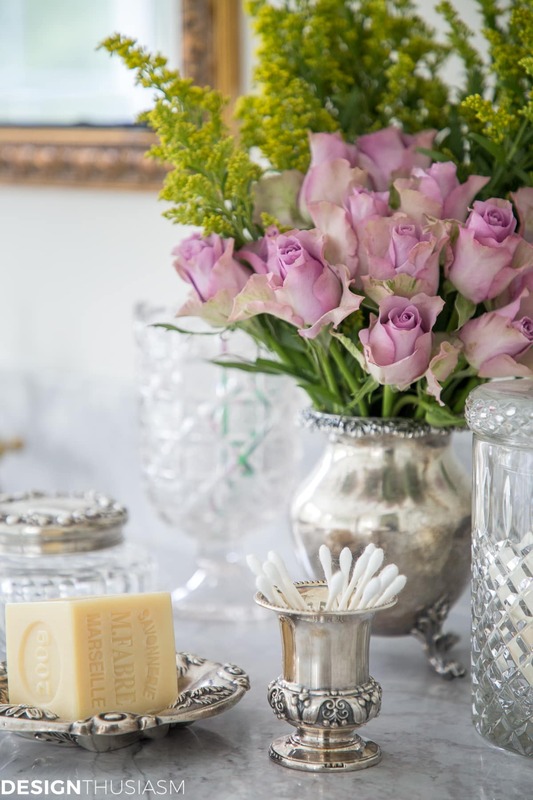 I enjoy using antique crystal and silver to house the items we use for everyday grooming, from soaps and cotton balls to toothbrushes and q-tips. I also added a vintage clock, found at my parents’ house, which fit right in between the two mirrored cabinets. I’m also a huge fan of plush white towels, which we use daily for the shower or bath, but I keep a darker grey hand towel on a hook by the sink for face washing and makeup removal. 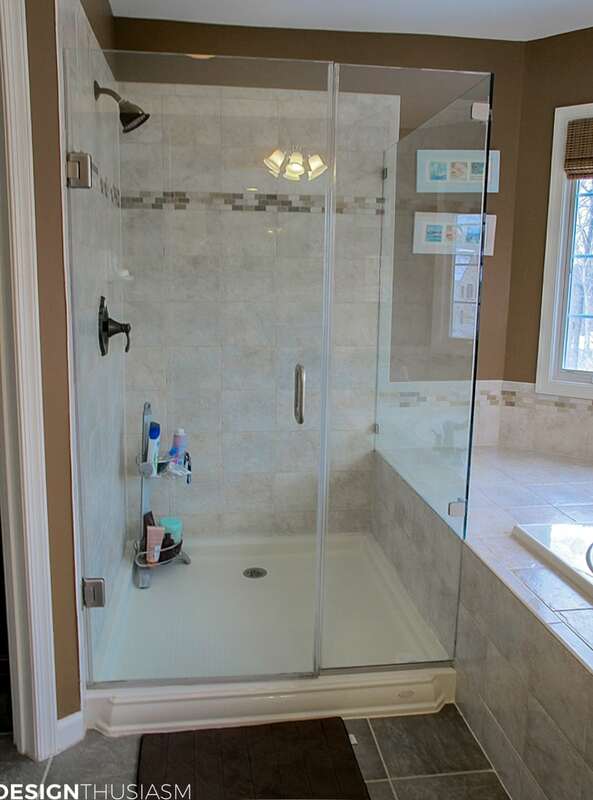 We were able to save the glass of the main door, but had to re-do the side to line up with the new shower floor. We had a large recessed nook added to the shower to accommodate shampoos and other bath products. You can also see my squeegee that I absolutely use every day. It takes 2 seconds and keeps the glass doors looking spotless. It’s such a pleasure to wake up in the morning and start my day in this light filled bath. The footprint is exactly the same as before but now I am welcomed by all my favorite things! 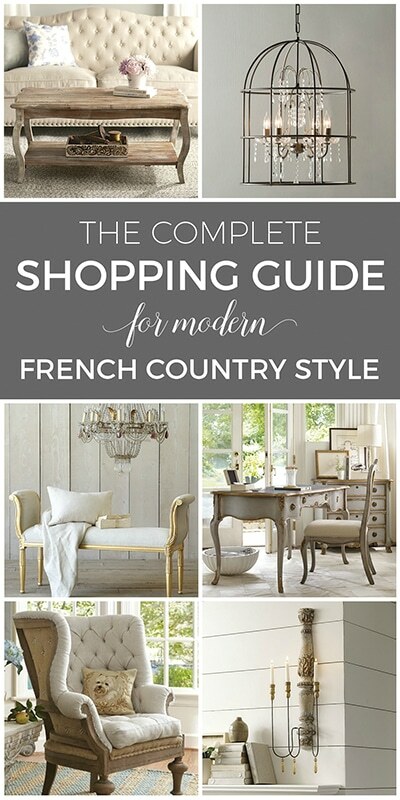 Master Bathroom Source List – To get the look, click on the items below for direct links to the products. Where actual items were no longer available, I’ve provided similar options. Very serene! I like the use of old silverware in the bathroom. 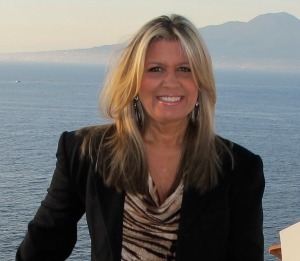 Beautiful transformation, Lory and I love your vintage pieces. Love it! What color did you use for the walls? Thank you! It’s BM Tapestry Beige. 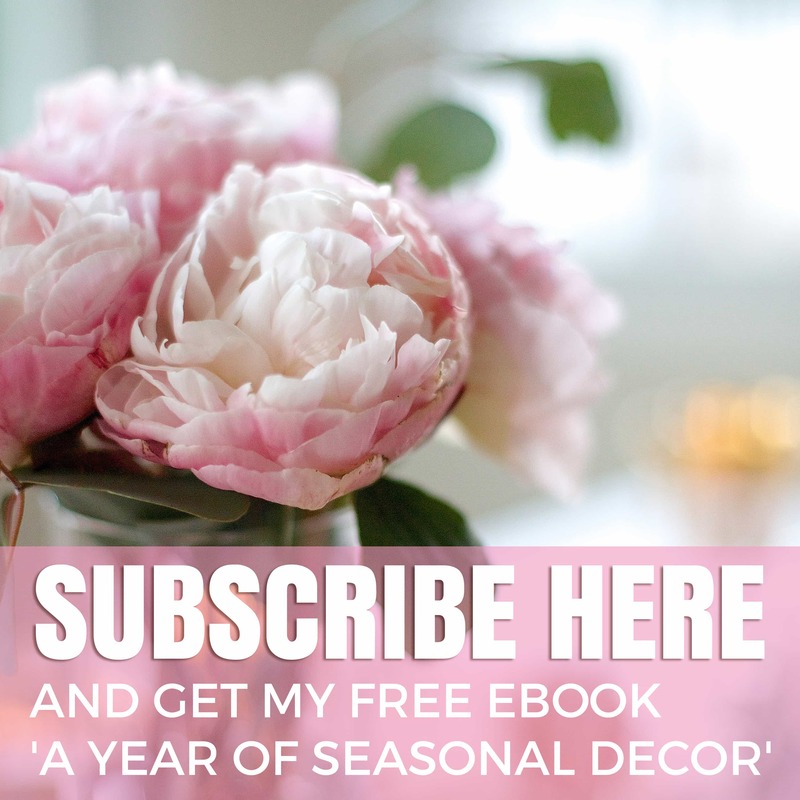 Thank you and glad to be inspiring… 🙂 It’s always hard to make the decision to re-do a perfectly good, reasonably new bath, but life is short and we have to surround ourselves with things we love. Wow! This looks amazing…such a beautiful transformation! Well done, Lory! Beautiful! What tile did you use on your shower stall floor? Thank you! That tile is also porcelain, like the walls. Just cut into smaller squares. I’d guess about 3″ x3”. The seat in the shower and the sill are carrera marble slabs. 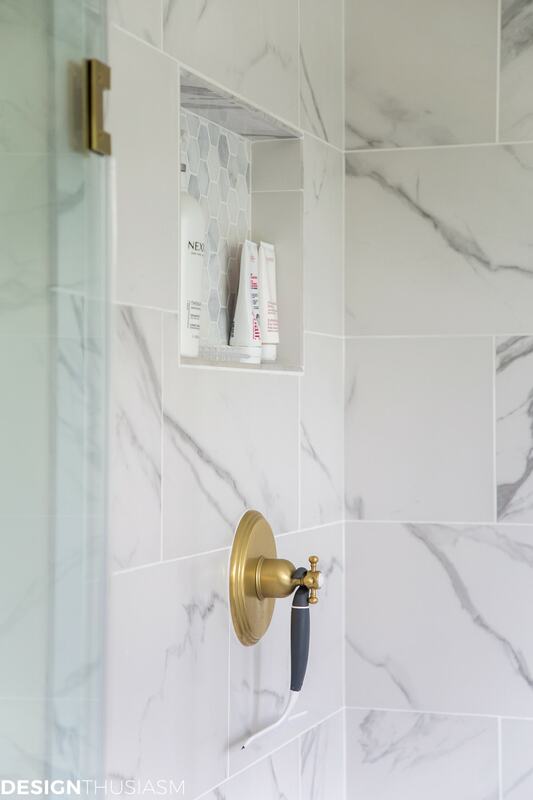 The tile in the wall inset (for the shampoos) is the hexagon floor tile that is marble. 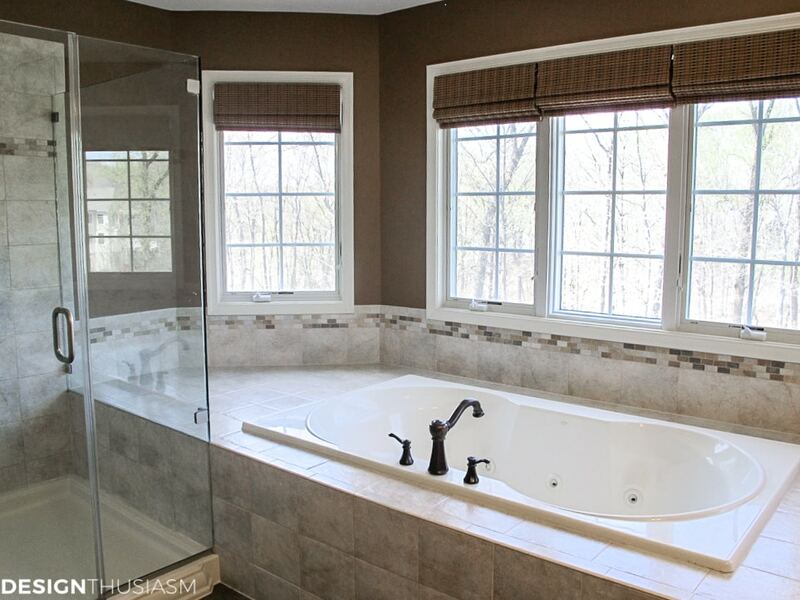 Beautiful, except I would have ripped out that space hogging tub …and put in a stand alone. Then possibly increase shower size. Thank you, Susan! I talk about why we didn’t do this in the post. Beyond gorgeous! This really says “Lory”! We are currently updating a bathroom upstairs. The theme is Earl Grey Elegance and our guys really like what is going as the youngest almost a teen and excited on what is currently going on. The paint is a called a Brazilian Tan and I am adding accessories in dark grey towels with light grey tumbler and soap dispenser. Have other small things coming like a curtain we will make, but all in all we are really happy with this theme and look. Btw, little known fact – I’m a big earl grey fan! Only flavor I drink… 🙂 Good luck with your project!! It sounds lovely. It’s just beautiful! The vintage pieces really pop and look like they were meant for the space. 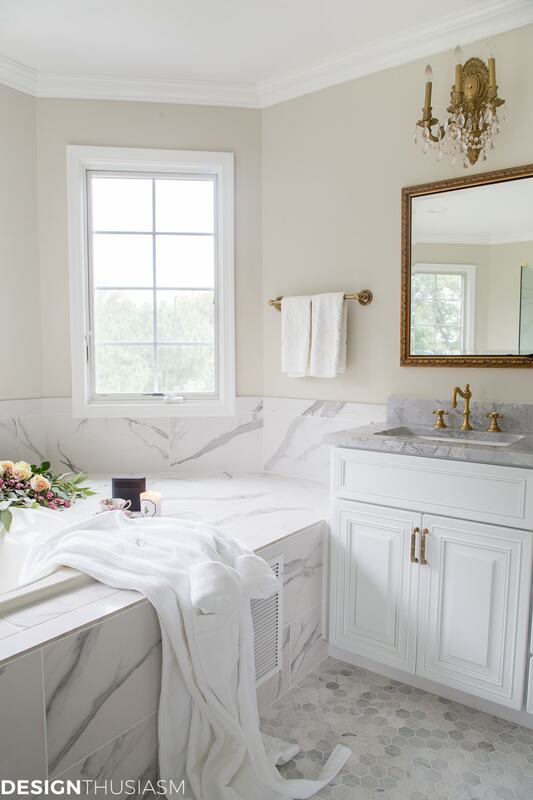 The look of the marble is so elegant and classic. I, too, love a bright and gracious space, and your bath redo hits the right notes all the way around. You have done it again!!!! 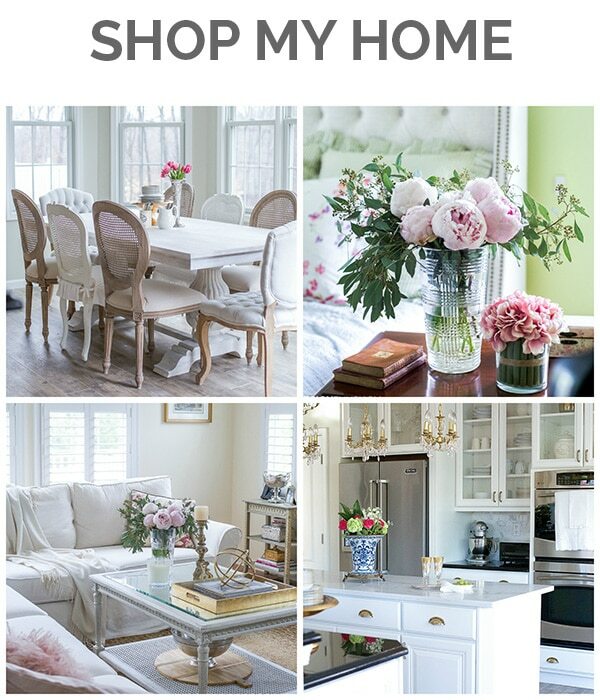 Your home is just so inviting, stunning and inspiring!!! Beautiful!!!! Thank you so much, Nancee! What a lovely comment!! It’s beautiful! I love everything about it, from the marble to the gold. And, using vintage silver in your bath adds an old world charm. The detail on your cupboard fronts – what would you call that? Very beautiful!! I am getting inspiration to update our guest bath and came away with ideas. 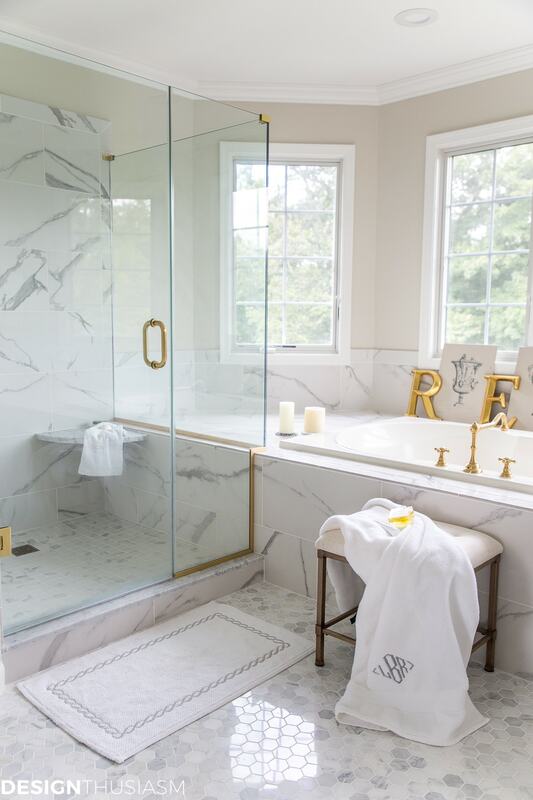 I love the floor tile and also want to do gold fixtures. The only question was the link to the bath rug. The price was over $200! Are you sure that is correct. I can’t imagine any rug costing that much for a bath rug. Thank you for the kind words, Nanci! Re the bath rug, that probably warrants some explanation. 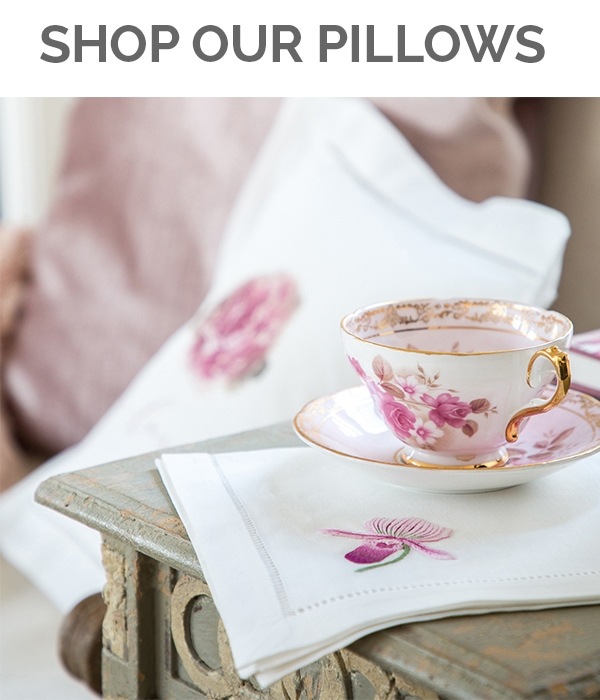 In general, I have a theory about little luxuries in life. I believe these small pleasures and refinements add a touch of grace to our lives and whenever possible, I like to add in little bits where attainable. So for instance, instead of replacing the tub with a $5000 free standing tub, I saved money and retiled the old tub surround. Then I splurged on a fine Matouk bathmat. It’s a lot easier and cheaper to spend $125 more than normal on a bathmat (I got it on sale for $175) than $5000 on a tub. I understand this is not in everyone’s budget, and there’s no shortage of affordable white bath mats available. For me, the lovely little embroidered detail, not to mention stepping out of the shower onto this fine luxury mat, was worth stretching for. This is an example of the kind of little luxuries I often talk about. Not everyone can afford to renovate a bathroom from top to bottom. But a lot more people can spend a couple of hundred dollars to add a note of luxury to their existing home. Makes sense! Understand what you’re saying. This bathroom remodel is stunning Lory!….You are speaking my language!….just finished going over some basic choices/design for our new house for our master bath and I know I will be making my contractor crazy, as I did 15 years ago….he says, “what’s with all the white and barn doors?” gotta love him!…but no barn doors for me…Gorgeous remodel!!!! !…and yes, always worth the money getting what you want! Thanks, Shirley!! Funny thing is, I wanted white 20 years ago when my contractor talked me out of it saying it was a trend. Here I am 20 years later still wanting white, so this time, I insisted… 🙂 No barn doors for me either. Good luck in your new place! 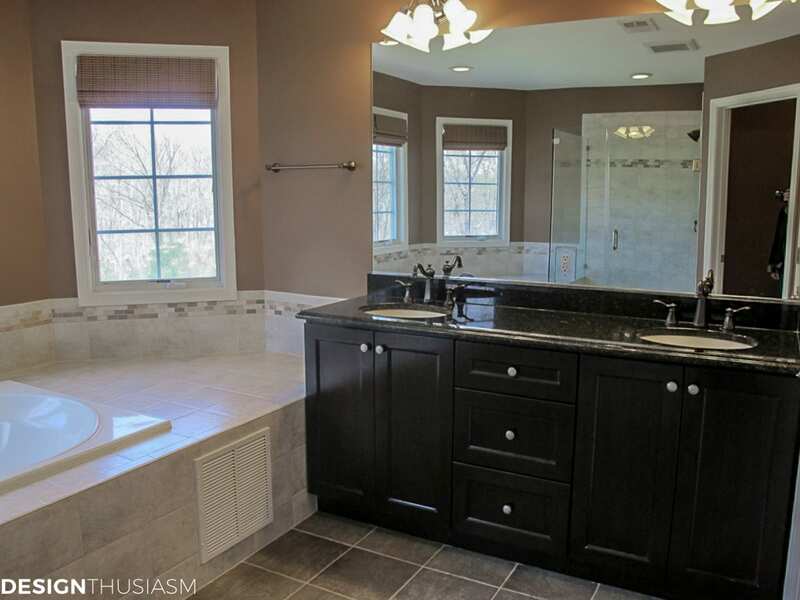 Your master bath is gorgeous and inspiring! We are planning a bathroom renovation and I am having trouble finding a vanity with solid reviews. Two questions! 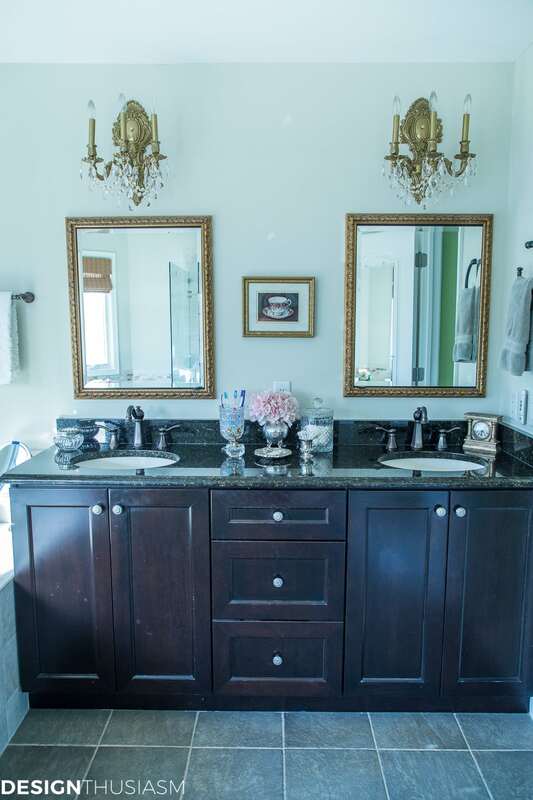 Are you pleased with the vanity ie… paint job, construction, delivery, etc.?? Secondly, the vanity you linked on the Wayfair website has single knobs on all the doors and cabinets. Did you remove them, fill in the holes and touch up with paint before installing the drawer pulls that you purchased separately?? Hi Joyce, the Wayfair vanity is a substitute vanity I selected to offer people a similar option. I had mine made by my contractor. But I have bought ready made vanities in the past without a problem. Thanks for your kind words!! OMG! The most beautiful bathroom EVER! FABULOUS! WOW! What a transformation! You must be in heaven. 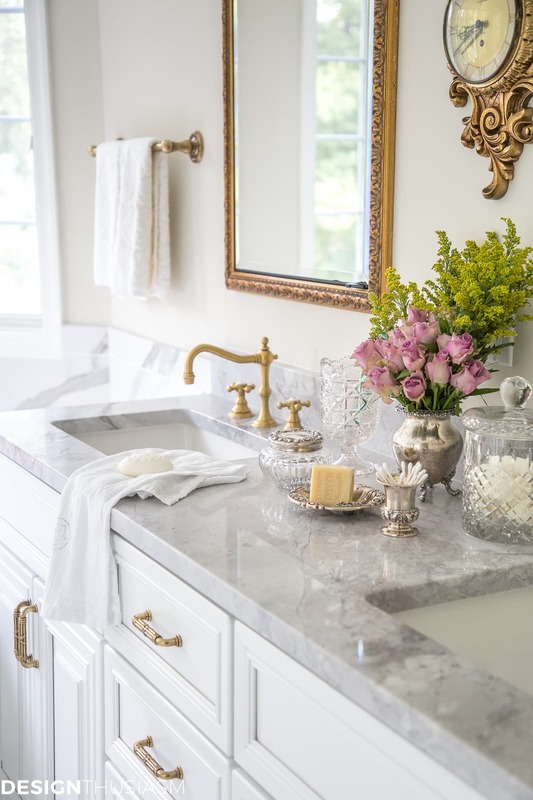 That vanity is divine – the marble, sinks, faucets – everything is gorgeous and goes so well together. Beautiful job! The clock between the mirrors is better than the picture. It doesn’t even look like the same bath. LOOKS GREAT ! Beautiful and peaceful bath. 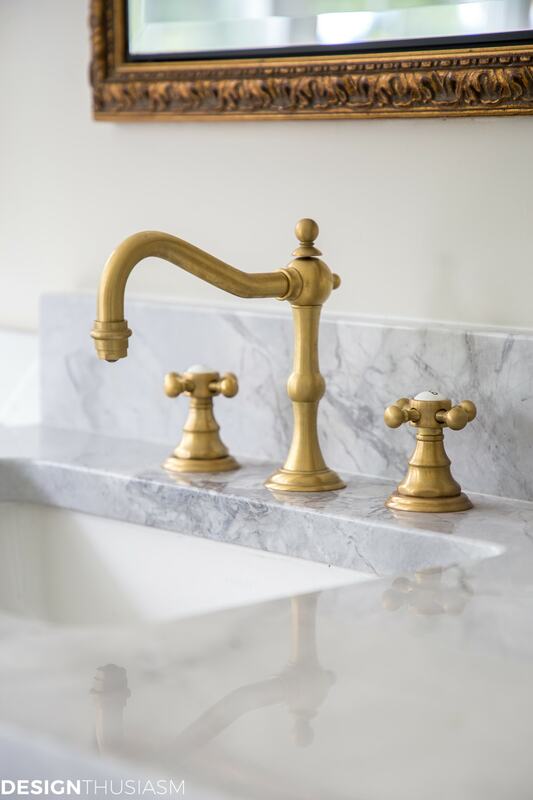 Which sink faucets did you actually use in your bathroom? Thank you, Marsha! The faucets are from California Faucets. It’s the Salinas 8” Widespread Lavatory Faucet in satin gold. WOW! What an amazing transformation. I am getting inspiration to update our master bath and came away with ideas. I also love the floor tile. can’t wait to make my bathroom like this way. Thank you so much for sharing this. Thanks so much for the kind words and I’m glad you felt inspired!! It’s beautiful Lori, I love it!! And I love your choice of tips holder! My husband uses a paper dixie cup to hold his…so ghetto! This is stunning! I am replacing my vanity in the next view months, and plan on using this on my inspiration board. Love the fixtures! Can I ask where you got the clock? It is gorgeous. I already have 2 mirrors I am going to use, and it never occurred to me to put a clock in between them. You are so creative! Thank you so much! I actually got the clock from my parents’ house… 😉 I remember it being there since I was a kid. I would try eBay or Etsy for something similar. Gorgeous. Gave me inspiration. Where are your glass jars from? Looks beautiful! We are in the planning stages or redoing our Master Bath also. I have been pondering the vanity-height question as well. I’m curious how high your original vanity was, and how tall you are. Also wondering what height you went with for the replacement vanity. Our current 32″ height vanity seems a bit too low and seems to me that perhaps 34″ would be about right. I am 5’2″. I would greatly appreciate any input on this! The Hubs is 5’9″. Thank you!! Thank you! The original one was 36” high. I’m 5’1” and hubby is 5’8”. He didn’t want it lower, but I truly couldn’t reach it comfortably and we have other vanities upstairs he could use if necessary. As it turns out, he uses it all the time… 🙂 I think we went with 32”, although I’d have to measure to be sure because we went back and forth. Thanks so much for the response Lory. The entire room is just lovely! I love your bare windows but what do you do for privacy.